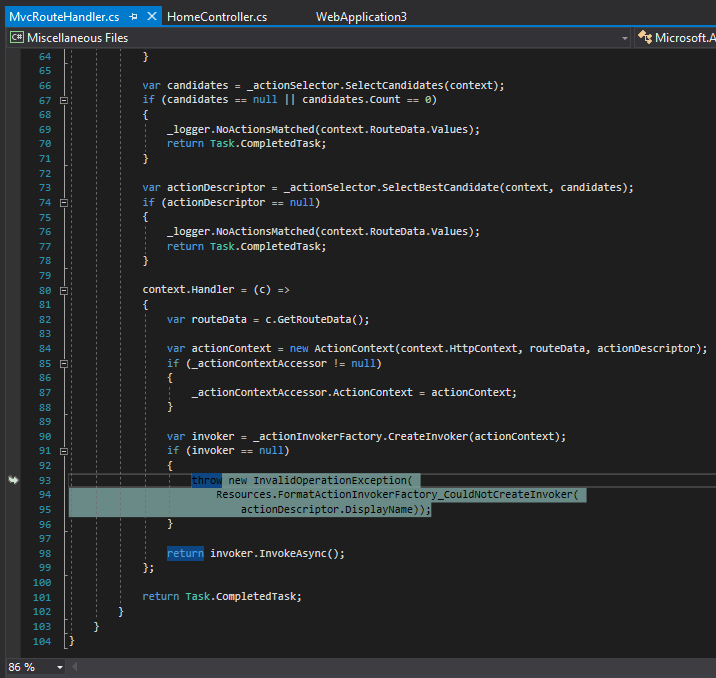 In the early days of ASP.NET Core 1.0, before Visual Studio 2017, back when we had the project.json project format, we were able to take advantage of a nice feature to enable source debugging of referenced libraries and code. We could add the paths of cloned source repositories into our global.json file and these would then be preferred over Nuget when available. I used this quite extensively when writing some of my posts for my MVC Core anatomy series (something I hope to get continue with at some stage). 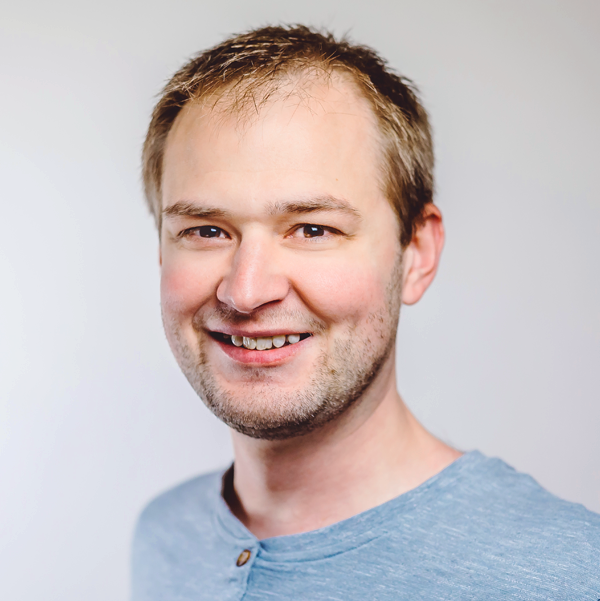 I blogged about how we could set this up in this previous post – Debugging into ASP.NET Core Source. Unfortunately with the switch back to MSBuild and csproj, we lost the ability to easily debug through the ASP.NET Core source files. Yesterday during the ASP.NET Community Standup Jon Galloway highlighted a tweet by David Fowler regarding new ASP.NET Core source linking support. Damian Edwards went on to provide some more detail about this new feature and afterwards I decided to take a quick look at it myself. I expect this post to serve as an early introduction to source linking and I will hopefully blog on more detailed elements once I’ve had time to explore them more fully. For this post we’ll focus on how we can get started with debugging into the ASP.NET Core source using source linking. Let me caveat this explanation with the fact that symbol files are not something I’ve previously messed around with besides knowing that PDB files existed. I’m coming at this blog relatively fresh. I’ll be explaining things as I’ve understood them so far and will happily make corrections and updates if necessary. Like me, you may have noticed PDB files being created under some circumstances when compiling your code. These files hold the symbol information which can optionally be used to support debugging into external source. Some types of symbol files may contain some of that source code or mappings to the source code. For a long time Microsoft have hosted Symbol servers which hold published symbol files for the Microsoft products such as .NET Framework and ASP.NET Core. 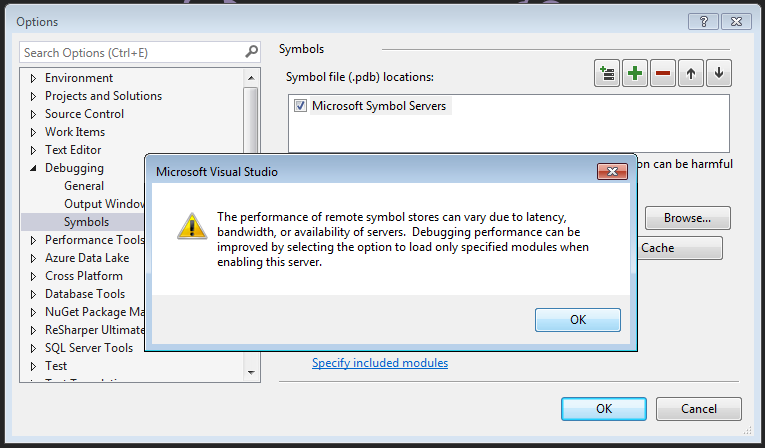 Visual Studio supports downloading symbols dynamically. 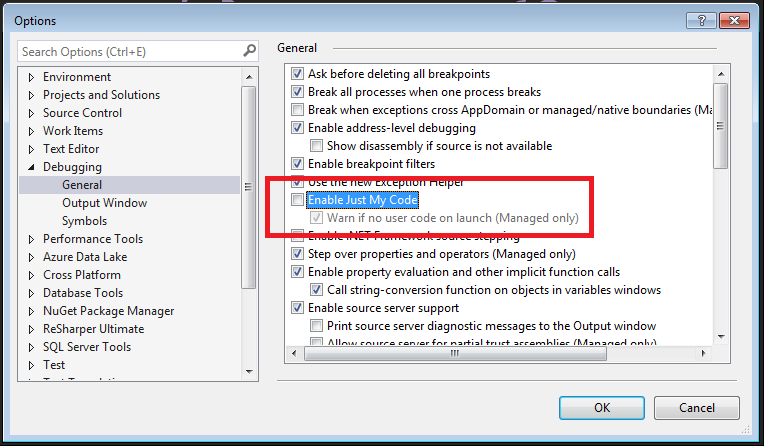 To do this you must disable the “Enable Just My Code” option in the Debugging > General options. By default this option is enabled in Visual Studio. For more information on Symbols, Symbol Servers etc see this MSDN link. Source linking allows you to embed a manifest inside the symbol file. For a given method name and location in the method that is being called it can identify what file contained the code and where it can be retrieved from. The ASP.NET Core libraries (not .NET Core currently) now support Source Linking and provide links to the code which is hosted on GitHub. The first requirement is that you are running Visual Studio 2017 on the latest update (15.3) which added Source Link support. 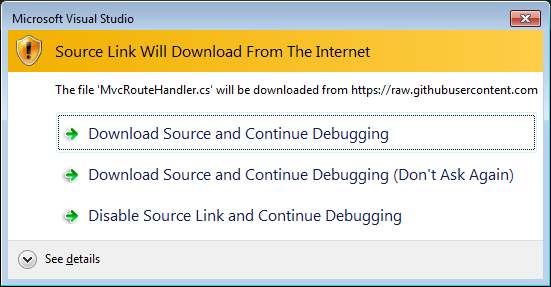 With this installed if you check the Debugging > General options you will see Source Link enabled. As well as ensuring “Enable Just my Code” is not checked you must also enable the Microsoft symbol servers. 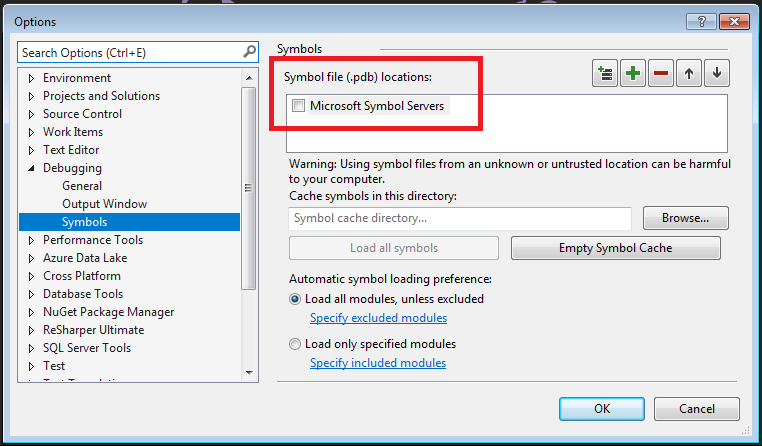 In the Debugging > Symbols options you can check the “Microsoft Symbol Servers” from the list of symbol file locations. When enabling the symbol servers you will need to accept the possibly the performance impact that it may introduce when debugging. We are now setup and ready to debug into the ASP.NET Core source. 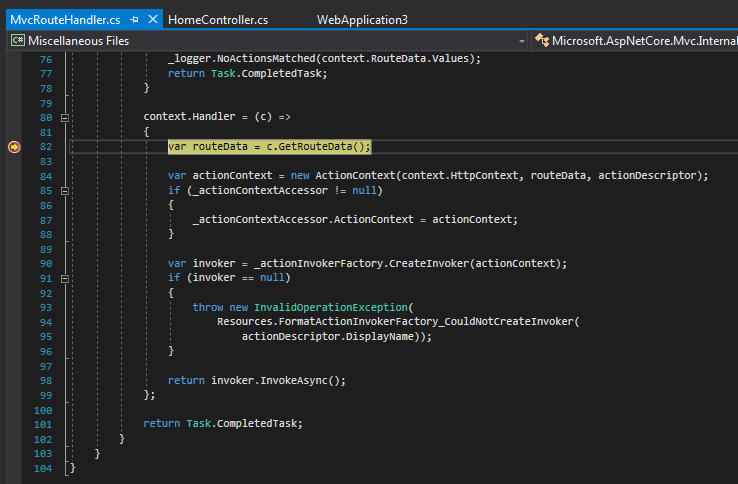 To test this I created a default ASP.NET Core 2.0 MVC project inside Visual Studio. I then added a break point to the Index action on the HomeController. I then started debugging the application. The first time when debugging you may see messages like this in the status bar. This is the symbol files being downloaded and may take a short while to complete. 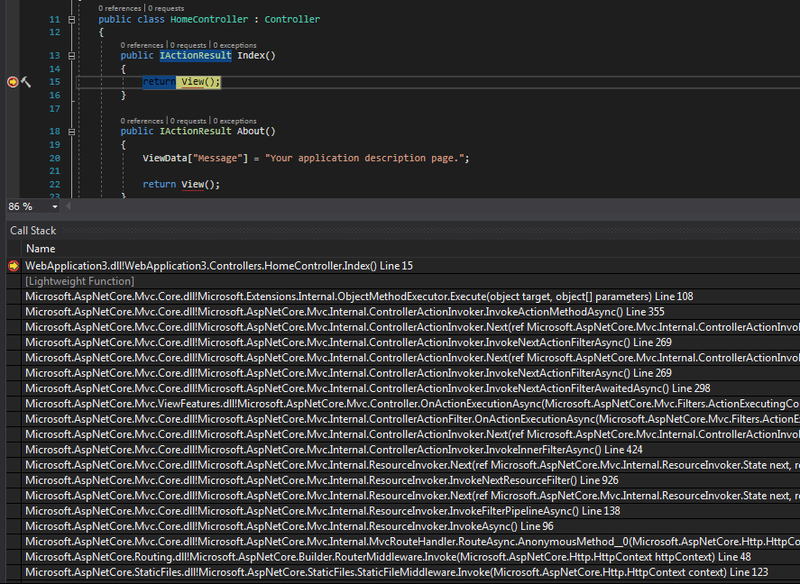 Once you application is running and the breakpoint in your code is hit you can navigate down the call stack to see all of the external ASP.NET code that is being executed. You can chose the first option to download for this specific source file and continue to debug using that file. 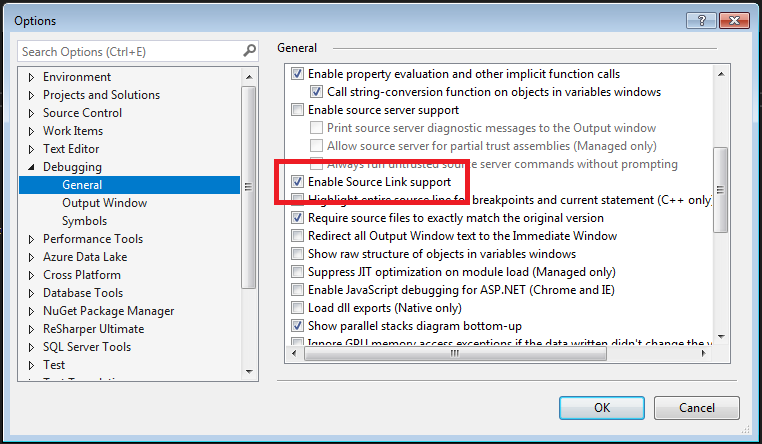 If you chose the first option you will see this dialog for each new source file that is required. You can select the second option instead which will download the file and disable the warning for future files. Now that we have the source it will be displayed at the appropriate location from the frame you selected. Now that we have the source file, you can also add your own breakpoint somewhere else within that file which will then be set to be hit when debugging your application. Even if we stop debugging and start again, this still seems to be hit successfully. I was also curious about how we could set breakpoints in other parts of the code, without having to rely on access the source via the call stack. Damian mentioned a feature I’d never used where we can set a breakpoint manually from the breakpoint window. I have attempted to set a new function breakpoint up to one of the ASP.NET Core methods but so far I haven’t been able to get it working as Visual Studio states that the source is not available. I will pursue this and hopefully include details in a future post. It’s great to see the beginning of easier debugging of external source coming to ASP.NET Core. Already there is value that I can gain from this feature to allow me to debug into the ASP.NET Core source to understand the internal workings. It’s not a sweet as what we were able to do back in project.json days but is certainly a step forward since we went back to csproj and MSBuild. I miss the simplicity of cloning the full source for a repository and being able to navigate through it and add breakpoints to the external code. The source linking mechanism is good for more specific debugging cases where you want to dive into the external call stack. At the moment, once you have the source cs file via Source Link, you can’t navigate to other methods so exploring the code and setting further breakpoints is not possible outside of that file. If I can get the manual breakpoints working then that will be slightly better as at least I can view the source and determine methods I might want to break on, then set those up manually. Chatting to David Fowler on Twitter I also understand that more features are being planned so I’ll be watching for those with interest. In addition, work is underway to get this supported by other non-Microsoft OSS projects such as Xunit and maybe in the future, JSON.NET. This repository (which I’ve not dug through yet) provides some build tools which can help creating source link symbols. I will also be looking at this more in the future.